As you know well by now, it is winter here in Central City. It seems like the perfect time to pretend I'm going down a rocky slope, tricking off ramps, and grinding on rails to impress several onlookers. 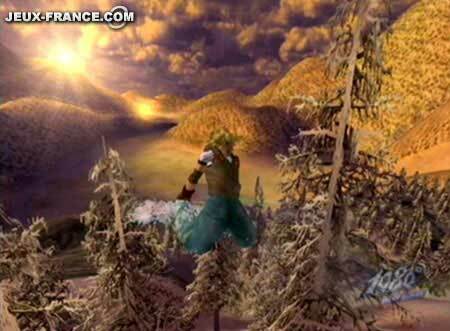 This wish comes true with NST's 1080: Avalanche for the Nintendo GameCube. Received by a trade, I was wanting to have this game as part of my collection, and now I finally have it. Let's see if my time waiting for it paid off. 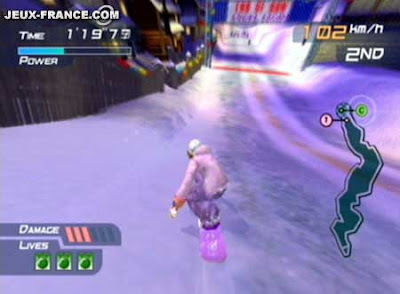 When it originally released back on the Nintendo 64, 1080 Snowboarding, along with Tony Hawk Pro Skater, was one of the main pioneers of the extreme sports genre in gaming. 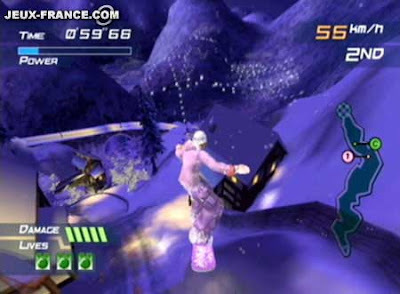 The game allowed players to shred down slopes, race with up to four players, and play in a veritable winter wonderland. Now the genre is much more crowded with EA's SSX and its many sequels taking top honors when it comes to virtual snowboarding, so Nintendo's answer, 1080: Avalanche, has a lot to work for if it plans to overcome EA's snowboarding beast. Does 1080: Avalanche manage to stick a perfect landing, or does it wipe out? 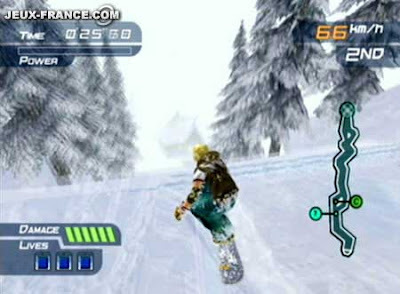 1080 2 offers a wide range of modes for players to participate in and shred the slopes with. There's Match Race, Time Trial, Gate Challenge, and Trick Attack. Match Race has three difficulties: Novice, Hard, and Expert. 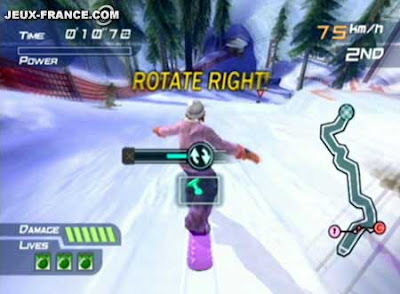 In each of these you race one-on-one against a computer controlled opponent down various slopes in an effort to make it to the finish line before the AI manages to do so. For each race you receive three lift tickets. These are essentially lives. If you restart a race or fail to beat your opponent, you surrender one of your tickets. If you run out of tickets, you get a game over and must start the series of races from the beginning. Unique to Match Race is the ability to perform tricks to build up your power meter. When it is full, not only can you knock down your racing rival, but you can also recover from nasty spills and falls much more easily. The final challenge in Novice, Hard, and Expert Match Race has you facing off against not an AI rival but the mountain itself. You will be chased relentlessly by the titular avalanche as you zoom down the mountain in a frenzy. Falling down is without a doubt certain doom, so it's best to keep your board centered and your mind focused. You only get three lives, so make them count. Time Trial requires you to beat a target time and try to achieve the record time for the course. This can be easier said than done on later courses where the time needed is much stricter. As a side mission you can collect five pieces of a gold coin that are hidden or placed in out-of-the-way locations. This is where the course design really shines in 1080: Avalanche as the pieces are usually placed in areas that require you to explore the courses. Thankfully, you need not try to beat the record time and obtain all five segments of the gold coin in the same run. The prize for gathering coins is that new boards are unlocked for the five snowboarders the game possesses. Another mode in Avalanche is Gate Challenge. This is a slalom-like mode where you race against the clock, going through gates, earning points, and trying not to bail. Each of the game's courses are split up between zones. Each zone is divided up between multiple gates and concludes with a checkpoint. When you reach a checkpoint you receive valuable bonus time. If you managed to pass through all of the gates in a given zone, you get a perfect zone bonus added to your score. Finally, there's Trick Attack. This mode grants you the ability to perform tricks as you gun for the high score before you reach the goal or time runs out. There's various environments on the courses such as large ramps to trick off of, half pipes, and terrain parks full of moguls and smaller-scale ramps. 1080: Avalanche's controls may take some players some getting used to, but once they click, they become second nature. For starters when you reach a ramp or a place you want to jump, you need to hold the A button down. However, you need to time it so the jump meter is at full capacity when you wish to make your leap, otherwise the meter might reset and you won't catch as big of an air as you desire. With the control stick you can steer your boarded left and right, hold it back to brake, and even brake and press left or right to make sharper turns in exchange for some speed. The L button proves to be a lifesaver as not only can you hold it down to tuck, allowing you to achieve a higher top speed (but your maneuverability greatly lowers), but you need it to stick landings. Without doing so you'll either crash or get off balance. When this scenario occurs, you must quickly rotate the control stick in the proper direction to lower a meter. If the meter fills, you crash and burn... well, burn as much as you can on the frozen slopes at least. direction to keep your balance. Of course, there's more to Avalanche than just the basics. For instance, your boarder can grind on rails and Tony Hawk Pro Skater-style you use the control stick to center the cursor on a meter to stay balanced. Meanwhile, tricks are performed by holding one of the face buttons. Your boarder can only do grabs, unfortunately, which gives little in the way of variety. As you grab, you rotate the control stick to perform spins. I still am not used to this even after multiple hours of practice and play. Don't worry that he's not dressed for the slopes. The adrenaline keeps him warm. From speaking about controls to conversing about courses, 1080: Avalanche has a wide selection of slopes to shred down. They're full of shortcuts, hidden paths, and dangerous obstacles to avoid. Sometimes avalanches are a beneficial thing as they open up new routes to explore. There's also caverns that cave in, buildings that can fall apart, wildlife such as deer to dodge, deep powder that slows you down, ice that speeds you up in exchange for traction loss, and rock slides to outmaneuver. You'll board through sawmills full of moving logs, nighttime ski villages composed of secret paths through lodges, and outrun astonishing avalanches that will have your heart pumping as you speed and snowboard for your life. This nighttime course is one of my personal favorites. 1080: Avalanche contains the option for up to four players to take each other on in splitscreen action. And since this was the Nintendo that did not know that the Internet and online play existed, the only option for more players to participate in races and shred fests is LAN play. Yes, connecting multiple GameCubes with multiple copies of the game with multiple controllers and multiple memory cards and multiple broadband adapters. Trust me when I say it isn't worth the trouble. Avalanche features some impressive visuals. When your boarder crashes, the snow routinely piles on and gets stuck to their clothes and outfit. Snowboarding on the courses does not feel as fast as it should most in part because the game runs at 30 fps and not 60 which is a bit on the disappointing side. Regardless, small features like your boarding shooting out particles of snow from behind, trees that come crashing down and kick up snow, and wildlife that scamper away as you slide down the slopes towards them are all truly great. What's not so great is some of the textures that still remind me of the Nintendo 64 days. That said, the draw distance is breathtaking and graphical glitches like pop-up are seen rarely if ever. Speaking for the soundtrack, NST has included a mostly rock-centric flair to accompany your boarding experience. Such bands like Seether and Cauterize lead the small sampling of songs available to listen to on and off the slopes. 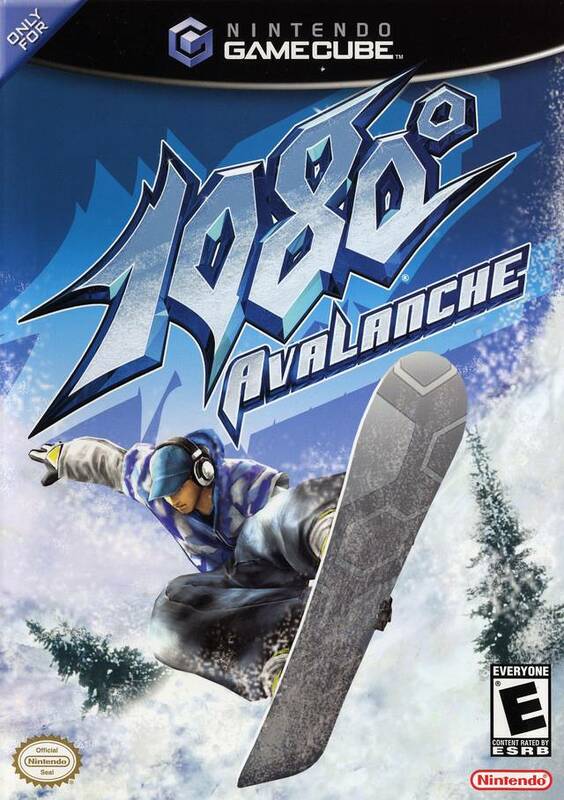 1080: Avalanche overall is a relatively short game that lacks a lot of depth. The races and modes are exhilarating, the boarders animate well, the attention to detail is tremendous, and the controls are mostly up to par, but this is a game that does not have enough content when compared to other games in the same genre and the same sport. Sure, there's cool unlockables like new boards in the form of a penguin and an NES controller, but you'll be done with the game within 3-5 hours. It is still a worthwhile purchase for anyone who is a fan of snowboarding and is either too lazy or not near a snow-covered mountain to do so themselves.